Earning nearly $140 million against a $54 million budget, it was inevitable to see the Hollywood action thriller film Escape Plan getting a sequel. Starring Sylvester Stallone and Arnold Schwarzenegger, Escape Plan centers on two brilliant businessmen who use their wit and physical prowess to escape the country’s most secured prison. After five years since the original, the film is finally coming back with a part 2—but this time without Schwarzenegger. 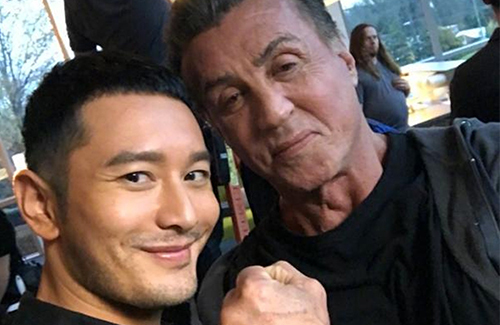 Escape Plan 2: Hades, which premieres June 28 in Hong Kong and June 29 worldwide, features the return of Stallone with Guardians of the Galaxy star Dave Bautista and Huang Xiaoming (黃曉明) in his official Hollywood debut. In Escape Plan 2: Hades, Stallone, Bautista, and their gang crash into a technologically-advanced prison known as Hades to save their disciple, played by Huang. If HZM can go to Hollywood, anyone can. Please don’t have his equally talentless wife follow him there, that would be a travesty of justice against the art of acting. Even if his english was impeccable, he is lucky he got any scenes at all, considering his lack of acting skills. He and his wife are over-exposed , over rated and overpaid. That is just my opinion. @bubbletea but she’s already there 🙁 in independent day 2! Haven’t watched any Stallone movies for a long time. Could not recognise him in the pix. Still playing the tough image? Stallone needs to lay off the plastic surgery and botox. He looks like a freak show nowadays.